Tom has been seeing these Barbara billboards all over town, but yesterday was the first time I noticed one. There was some kind of travelling cow exhibition in Paris in June, which we missed. Large cow sculptures were placed here and there, everywhere. 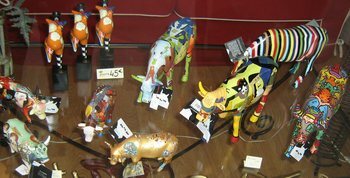 This shop on avenue de la Bourdonnais, near the Musée du Quai Branly, is still selling souvenir hand-painted cows from that event. Lida riding the swan? Atop the Swiss Life building across from the Square Louis XVI. 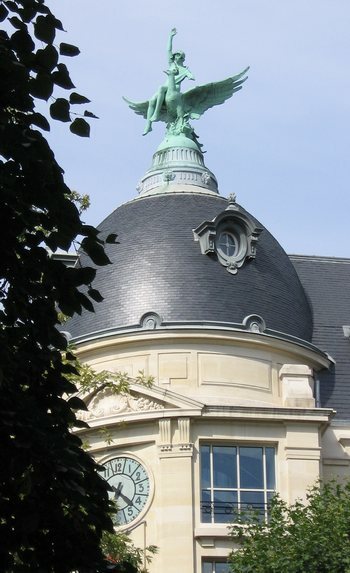 Yesterday was a dull day because we had to work, but at the end of the day we had to take the work to the Federal Express office in the 8th arrondissement. Wasting no time, we took the number 8 métro to the impressive Place de la Madeleine. Skirting around the church at Madeleine, we turned the corner at the very busy boulevard Haussmann (where a couple of the grand magasins are located, Le Printemps and Galeries Lafayette) and found our FedEx place. I expected the place to be busy and we would just complete the forms and present our package at the counter as we have done before. But the place was not busy when we entered, and one of the two clerks there said it would be much better if we worked with her to have the form completed on the computer, rather than by hand. Although I am sure that Federal Express office workers in Paris must be able to speak English, all of this was done in French, and it was not quick. However, our clerk knew to speak very distinctly, and because she did, we understood it all. This transaction took perhaps a half an hour. The package went off, with its neatly computer-typed paperwork, and landed safely at its destination in a mail room in New York at 9:30AM today. Whew! After the Federal Express experience, we decided to walk the long walk home. Going on down the boulevard Haussmann, we reached the Square Louis XVI, where one Louis had a predecessor Louis and Marie Antoinette re-buried twenty years after their beheadings. It is a lovely if somber square, and we needed to rest there because Tom’s foot was hurting. We went on down the boulevard Haussmann until we reached the Place Saint Augustin, where of course we visited the Saint Augustin church. Then onward down the rue la Boetie, to the Saint Phillippe de Roule church. All along this way, at the métro stops along the rue la Boetie, there were a number of police stationed, with paddy wagons nearby. They were obviously expecting some kind of disturbance, but as far as I can tell, nothing happened. Crossing the Champs Élysées, we headed for the avenue George V, but paused to remark how we had once had a very fancy lunch at the Fermette Marbeuf on the rue Marbeuf. We were surprised to find that when we examined the menu, it was not as expensive as we remembered. We may go back there soon. The interior of the restaurant is an amazing example of art nouveau décor. After ambling down the avenue George V and crossing the Seine at the Pont d’Alma, Tom’s foot was killing him so we stopped at a chic, expensive re-decorated brasserie called Café de l’Alma. We normally would not go to such a place, but we needed the rest and we needed it immediately. My glass of red wine cost an entire 8 euros, but it was superb. 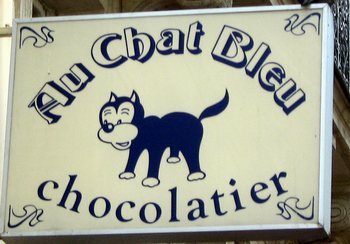 I noted that it was a Bordeaux called Moulin Lagune. Today I found it at Nicolas for 17.50 a bottle. I bought one. We finally made it home, and our heads were buzzing with all the frenetic noise and activity that we’d encountered in the 8th arrondissement on our walk, so we just decided to spend a quiet evening at home.